Shows readers how to navigate the most important development in job hunting: social media! In today’s economy job hunters need to use every tool available to them, and that includes social networking. Building on the author's "Get a Job!" and "The Perfect Resume," and his 20+ years of being a hiring manager himself, this book helps readers new to social media as well as old hands familiar with it. Readers will learn how to use each of the main websites -- LinkedIn, Google+, Facebook, and Twitter -- plus key personal and business blogs many may not have considered to successfully navigate the ins and outs of job searching on the Internet. Readers not familiar with using social media networking in their job hunt will learn what they need to know and consider. Those who know how to use this new tool will learn some new tricks! All will benefit from the author's personal experience of recently looking for work himself, and will read many useful personal anecdotes. Learn how to maximize Facebook Friends, LinkedIn Connections, Twitter Tweeple and so much more. No matter your age, job-seekers today cannot afford to ignore these social media avenues that will result in many more opportunities to find work. Author Dan Quillen beat this New Economy – and he can help you do the same. The techniques and tactics he shares in this book will help readers end their unemployment. Lance Farr has pioneered and directed a Social Media initiative with professionals to enhance candidate job searches while decreasing unemployment time to an average of 30 days. This is successfully accomplished by integrating LinkedIn, Twitter, Facebook and a blog in an intelligent and directed manner that will be revealed in this book. This strategy has resulted in increased job seekers’ search and reemployment success by dramatically increasing their relevance, visibility and exposure to targeted employers. 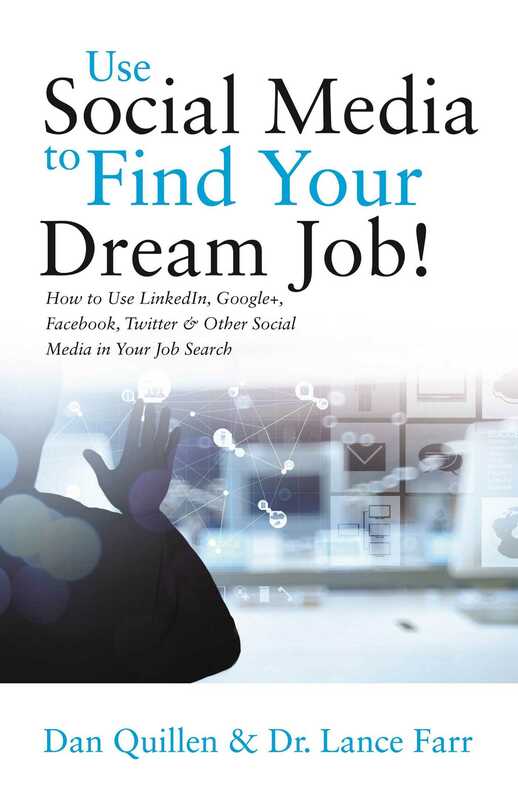 Book Cover Image (jpg): Use Social Media to Find Your Dream Job!